Strong, useful paracord rosary and accompanying steel beads help you build spiritual resolve and achieve personal growth just as long-lasting. Made from paracord, this copper pocket rosary has a unique ruggedness that will make it a wonderful gift idea for men and boys! Very nice enjoy it's color and size. Appropriate for carrying it in your purse Or pockets. Very happy with it. I purchased it for my son, who is in the National Guard, he can carry it with him because it is slim even and the paracord makes it durable. Love the color of it and with the St. Benedict cross to protect him. It puts my mind at ease knowing he has it with him while on duty. 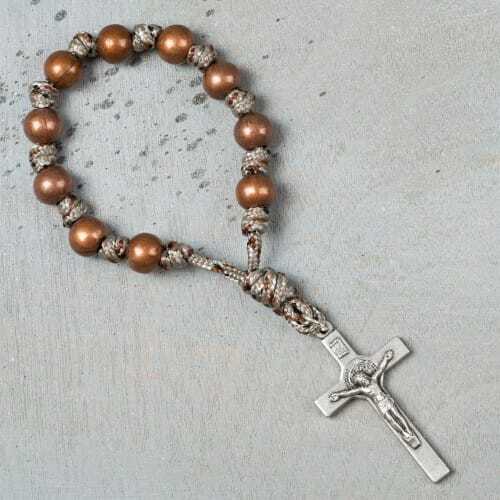 The perfect masculine pocket rosary! The photos just don't do it justice. This is a beautiful, masculine, prayer companion. As soon as I opened the box I knew it would be with me wherever I went. And it has so far. It is small enough to fit in a pocket without even feeling it. But as soon as I touch it, I feel peace and strength. When it arrived, the paracord was a bit stiff -- that was to be expected. Just give it a few "bends" (don't worry, 550 paracord is tough! ), and it breaks in and softens beautifully. Outstanding rosary! It has been a pleasure purchasing from the Catholic Co. I have found them helpful and fast. Any product I bought comes packaged beautifully. My pocket rosary is great. It feels heavier then its size and I carry it at all times. It has held up and still looks great. This has been an extremely useful tool for prayer. Thank-you Catholic. Co.! For such a small rosary it is so substantial. When I opened the box for the first time I immediately felt peace. This "prayer tool" is just what I needed to have with me throughout my day. Very well made for constant use and to be carried all the time.